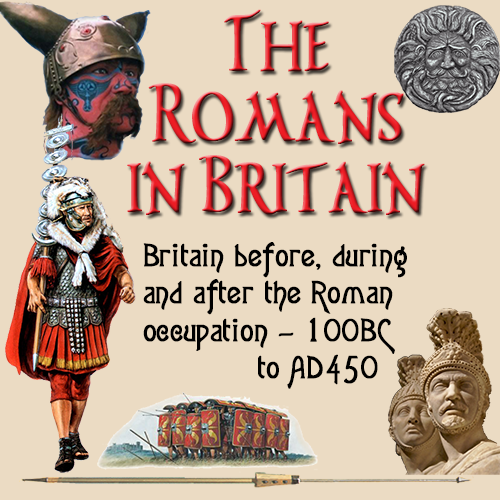 In the Roman army, a soldier's life was hard and tough even for the most resilient men. They were taken from their homelands, away from their families and friends and expected to defend provinces in far extremes of the empire. They had to endure hostile natives in foreign countries, who were defending their homelands from invasion. They were expected to undertake grueling marches across rough and dangerous terrain in severe weather conditions and then fight long and arduous battles with fierce warriors. Above all they had to obey all orders at once without question, no matter what the consequences. So what made them do it? Although there was conscription to the army, most of the recruits volunteered of their own free will. They knew of the dangers and hardship, but they felt it was their duty to serve the Roman Empire to their best ability. The thought of travel and excitement lured many to enlist. For others it was the opportunity to have a secure and reasonably well paid profession that would enable them to learn skills and gain promotion to a high level. Many craved the idea of breaking away for the drudgery of civilian life which was beset with uncertainties and insecurity. But above all, the recruits had one final goal in all this. When they retired after their active service, they would receive land and a regular income to support them. Besides, in civilian life, they would have to work until they reached a ripe age before being allowed to retire. Whereas in the army, they would be retired after a set 25 year period of service. So while their civilian counterparts were still working to an old age, the retired Roman soldier would have a decent and comfortable existence. On entering the army, the recruit would have signed on for a period of 25 years. Normally, he would have been 18-22 years of age on entry, although there is a recorded instance of a legionary, Marcus Valerius Latinus, who was accepted at the age of 15 . Officers from influential families came into the army at a higher level because of their connections and enjoyed a shorter period of service and would only hold a post for a few years before being moved either sideways or upwards. Often these men progressed their military careers by serving time in civilian postings were they could influence the politicians as well as their generals. Not everyone was accepted into the army. Recruits had to undergo medicals and assessments to ensure they had an acceptable level of fitness and strength on entry. This meant that they could be trained faster than the recruits who had to be given physical instruction to get their bodies up to the level required. Physical attributes were not the only qualification. A recruit had to show that he had a good character and a true Roman citizen. This could be achieved by natural birth into a Roman family, or in the case of recruits form the provinces, by swearing allegiance to the emperor and taking Roman citizenship. All recruits had to swear an oath to the emperor. Not in person, but to the commanding officer that represented the authority of the emperor. By doing so they had giving their assurances to serve the empire, their unit and their comrades to the best of their ability. Once in the army, the recruit was put through a period of basic training and be marked on various activities. If a recruit showed particular skill is horse riding, he would go into the cavalry, provided he was also at least 5' 8" (1.72m) in height. Once the soldier had been issued with his uniform and weapons, then then followed four months of basic training consisted of a variety of instructions in weapons handling, tactics and hand to hand combat. The latter skill was not taught to a great degree, since Roman soldiers fought as a unit using standard battle tactics rather than as individuals. The unarmed combat techniques were intended for an extreme occasion such as a soldier being separated from his unit in battle and losing his weapons, or him being set upon in the street while out alone. Once the soldier had been thoroughly trained so that all this became second nature to him, he was then put together with the remainder of the class and they were all taught collectively how to fight as one unit. Physical training was not the only instruction they received. There were also the skills of observation, stealth, discipline and language to be taught. Language was important as the Roman officers gave out orders in Latin, which was their first language as most of them had come from Italy to serve in the provinces. 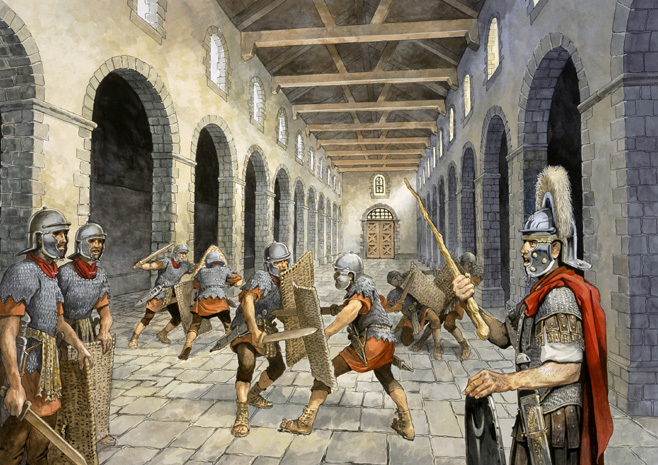 As the Roman army also took Romanised citizens from the provinces, these recruits had the extra burden of learning Latin on top of all the other skills they were expected to learn. On completing his training, the soldier would then be sent to a unit chosen by his commanding officer. There were many different types of unit, depending on their place within the military. Not all soldiers were infantrymen trained to fight as a unit. There were also the scouts whose task was to go ahead of the advancing main force and report on enemy activities. battles were not always fought out in the open, and these troops would travel about 1 mile (1.4km) ahead of the legion an spy out any problems that lay in waiting. An ambush by the enemy was the most common form of attack and it was the job of the advance spies to search out these hidden traps. There were auxiliary troops that fought on the flanks of the main force and protected the legion from attacks from the side. Behind the legionaries were the cavalry and behind them the support personnel. carrying the provisions and camp equipment etc. So the Roman army was made up of various factions all working together as one unit. For his first posting the recruit would be given a document that he would present to the commander of his new unit. This would give his name, age, a brief description and an assessment of his abilities along with recommendations as to the part he would play in the legion which was based on his strengths and weaknesses. 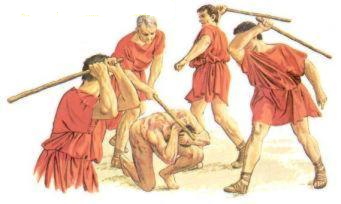 Life for a Roman soldier was harsh and uncompromising. 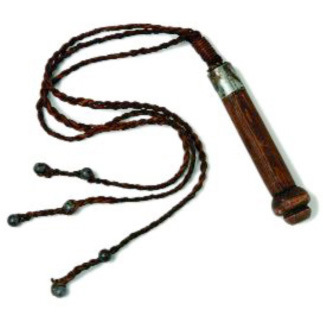 Centurions carried canes that they used frequently and with effect on anyone who was sloppy or not performing to the best of their abilities. A soldier could expect a variety of punishments for any violations he may have committed. Demotion, loss of privileges and a spell in the brig were the most common forms of punishment for even small indiscretions. More serious crimes such as theft of another soldier's property or desertion were treated as two of the most serious crimes and it was military law that they could, if the commander decreed, be beaten to death by their fellow soldiers. The most serious crime was cowardice. If only one soldier ran from a battle, then the survivors of the conflict would then face a fate that terrified them. Once a court had convened and the guilty soldier had been convicted of cowardice, then one in every ten soldiers from the unit would be executed. Those that were spared death were put on a ration of barley and water for a set period of time. As shown earlier, there were different types of soldier within and attached to each legion, and s such this was reflected in the rates of pay. Around 117-138AD, it was recorded that a top legionary soldier would receive 300 silver denarii a year, a trooper in the cavalry 200 denarii, a cavalryman in a part mounted unit 150 and a private in the infantry 100 denarii. Non Commissioned Officers (NCO's) were on a higher scale, with junior NCO's having 1½ times the basic rate, and the senior NCO's receiving double. However the soldier was expected to pay for items such as his uniform, weapons, bedding, the unit's burial fund and even for rations. By the time all the deductions had been made, he was left with about one fifth of his original earnings. Even so, the soldier had security and a level of pay that was higher than he would receive in civilian life.